Stocks across Europe and Asia advanced and U.S. futures rose after news emerged of a tentative deal among American lawmakers to avert another government shutdown. Treasury yields climbed. Carmakers led the advance in the Stoxx Europe 600 Index, while contracts on the Dow, Nasdaq and S&P 500 all pointed to a firmer open. The dollar held on to Thursday's gains after U.S. lawmakers said they reached an "agreement in principle" on border security funding that would avert a second government shutdown. The Trump administration said the president still wants to meet China's Xi Jinping in an effort to end the trade war. In Japan, the country's 10-year bond yields remained in negative territory even after the central bank cut purchases of some longer-dated bonds for the first time since July in a regular operation. The institution has sought to taper its purchases while focusing on yield targets rather than quantitative easing. Nissan reported worse-than-expected results. 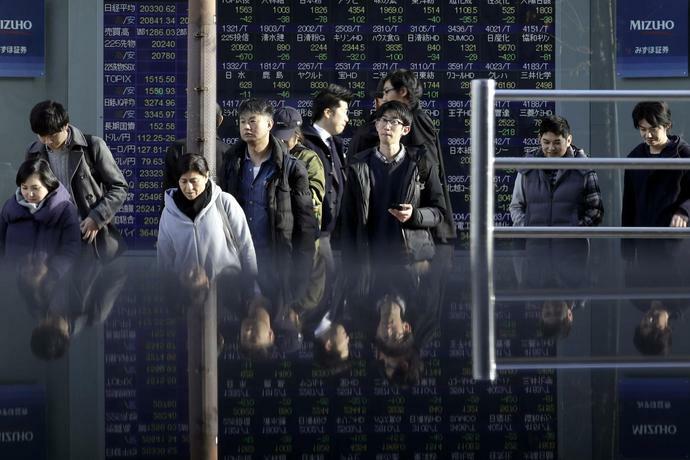 The prospect of a deal to keep the U.S. government open together with hints that President Donald Trump may reach an accord with China appear to be rekindling the rally in riskier assets after a turbo-charged start to the year showed signs of ebbing last week. A dovish shift by the world's central banks has also helped, but at the same time has underscored the dilemma facing investors -- join the chase for late-cycle gains, or gird themselves for a looming slowdown in growth. "The trade talks are key," Jason Vaillancourt, Putnam Investments global asset allocation co-head, said on Bloomberg TV. "If we can get a little bit of those growth engines starting to level out around the world, whether it be Japan or Europe, and just bottom out, then I think that will go a long ways to putting a base under risky assets." Elsewhere, Brent crude rose after its lowest close in more than a week. Turkey's main stock market was poised to enter a bull market. Emerging markets shares climbed and their currencies edged higher. The pound held steady as U.K. Prime Minister Theresa May prepared to update lawmakers on the progress - or lack thereof - of Brexit talks with the EU. The offshore yuan strengthened for the first time in five days. Chinese Vice Premier Liu He was expected to join U.S. Trade Representative Robert Lighthizer and Treasury Secretary Steven Mnuchin in high-level trade talks Thursday and Friday.Earnings season continues with reports from companies including Cisco, Vivendi, Nvidia, Nestle, Coca-Cola and Credit Suisse.Sweden's Riksbank is expected to keep interest rates at minus 0.25 percent on Wednesday after the first increase in more than seven years in December.Data Wednesday is expected to show U.S. consumer prices rose 0.1 percent in January, after falling 0.1 percent in December.If no deal is reached on the U.S-Mexico border wall, parts of the federal U.S. government may shut down again later this week when stopgap government funding expires. Futures on the S&P 500 Index increased 0.5 percent as of 9:30 a.m. London time, the largest climb in more than a week.The Stoxx Europe 600 Index advanced 0.6 percent.The MSCI All-Country World Index advanced 0.3 percent, the largest gain in a week.The MSCI Emerging Market Index increased 0.3 percent, the first advance in a week. The Bloomberg Dollar Spot Index gained less than 0.05 percent, hitting the highest in almost six weeks with its ninth straight advance.The euro decreased less than 0.05 percent to $1.1273, reaching the weakest in three months on its seventh consecutive decline.The Japanese yen sank 0.2 percent to 110.57 per dollar, the weakest in almost seven weeks.The British pound fell 0.1 percent to $1.2846, the weakest in more than a month.The MSCI Emerging Markets Currency Index jumped less than 0.05 percent, the largest climb in more than a week. The yield on 10-year Treasuries increased three basis points to 2.68 percent, the biggest climb in more than a week.Germany's 10-year yield climbed one basis point to 0.13 percent.Britain's 10-year yield increased one basis point to 1.191 percent.The spread of Italy's 10-year bonds over Germany's fell five basis points to 2.7283 percentage points. The Bloomberg Commodity Index climbed 0.2 percent, the biggest increase in more than a week.Brent crude advanced 0.9 percent to $62.06 a barrel.LME copper declined 0.6 percent to $6,116.00 per metric ton, the lowest in two weeks.Gold jumped 0.3 percent to $1,312.61 an ounce, the largest climb in almost two weeks. --With assistance from Todd White and Andreea Papuc.